I thought it would be interesting to compare the $74 Softrock Ensemble RX TX kits’ receiver to the DJ-X11 wide-band portable SDR capable receiver. This is certainly an apples to oranges comparison and completely subjective. Unlike the Ensemble RX TX which has a receiver that is limited to reciever the three bands it is built for (although it will receive pretty well slightly out side of those bands), the DJ-X11 is a wide band receiver that covers AM, HF, VHF, and UHF bands. All the radios were tested with the same antenna (20 meter attic dipole), on the same bands with the same center frequency, and at the same time of day within a 30 minute time frame. 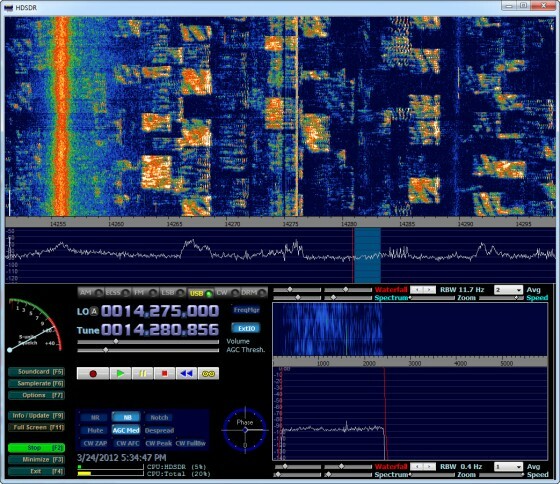 HDSDR was used as the SDR decoder for both the Softrock Ensemble RX TX and the DJ-X11. 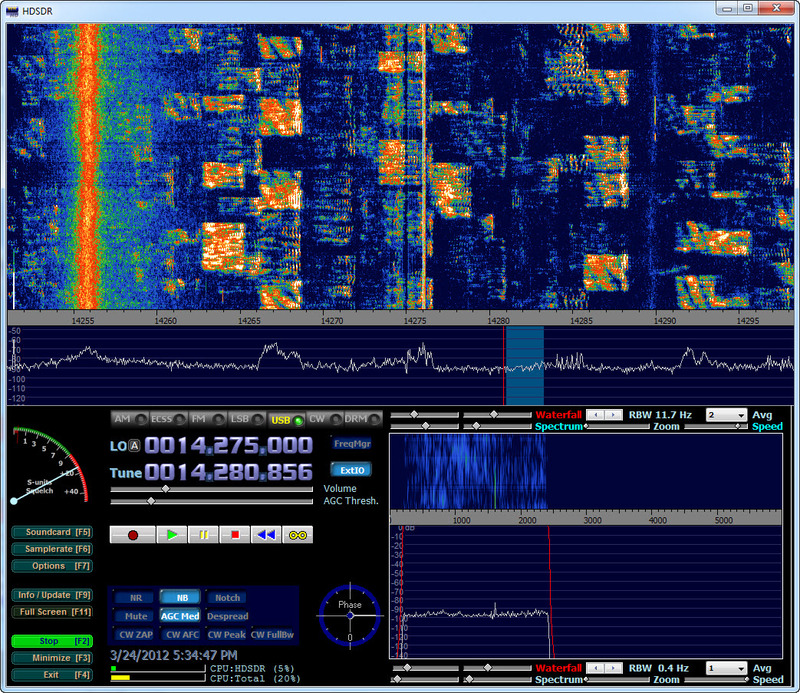 HDSDR will not tune the DJ-X11, so the center frequency was set manually on the DJ-X11. I typically use PowerSDR-UI for the Ensemble, but it does not decode the IQ signal as well as HDSDR does for the DJ-X11. I sampled the center frequencies of WWV at 15.000MHz, 14.070 MHz, and 14.275 MHz for both radios. I also used the non-SDR Yaesu FT-450D which is a mid-level modern ham radio transceiver as a baseline comparison on the 15.000 MHz on the WWV signal. My impressions were that the Yaesu with a bit of Digital Noise Reduction did a bit better on the WWV signal than the Ensemble or the DJ-X11. It seemed to have a slightly quieter and more solid copy on the signal than the other two. However, I would hope that it was a bit better than the others since it is about 12 times more expensive than the Softrock Ensemble. However, to be fair the Softrock Ensemble would come pretty close with a little tweaking of the AGC, noise blanker, and filters of the HDSDR software. The DJ-X11 was a bit of a surprise since it held up pretty well for a wide-band radio. The most noticeable differences in the DJ-X11 over the Softrock Ensemble was that the DJ-X11 had a higher noise floor than the Softrock Ensemble, was more susceptible to RFI, and the SDR audio was a bit more pleasant on the Softrock Ensemble. Again by applying the noise blanker, tighter filters, and tweaking the audio, the DJ-X11 performs very closely to the Softrock Ensemble. Ok, so which SDR was better? I would say that the Softrock Ensemble RX TX did a slightly better job on HF reception than the DJ-X11. So at the end of the day, both the Softrock Ensemble and the DJ-X11 are fantastic values as SDR radios in their price categories. The Softrock Ensemble RX TX sells for $74 as a kit and gives you RX and TX at 1 watt on three ham bands of your choice. The DJ-X11 at $319 gives you a wide-band SDR receiver that covers 50 kHz to 1299.995 MHz, an analog scanner, and a standalone receiver without the need to be attached to a computer. Of course you have to build the Softrock and the DJ-X11 is ready to go out of the box. There is a lot of discussion about which SDR receivers perform the best amongst SDR enthusiasts. Both the Softrock Ensemble RX TX and the DJ-X11 require a decent sound card installed in your computer to operate well. The better the sound card, the better performance you will get out of the sound card based SDR will perform. The direct sampling SDR receivers do not usually require a computer sound card for decoding the SDR signals since they typically use their own internal sound card to provide the IQ signals to the computer. However, the direct sampling receivers are much more expensive than the sound card based receivers. It is my opinion that the sound card based receivers offer a much better bang for the buck at this time without a huge trade off in performance. That may be likely to change down the road as the direct sampling units become cheaper. Anyway if you would like to judge for yourself, I have included the three SDR RF wave files below that ypu can download and compare the two receivers for your self. Just download the files and download a copy of HDSDR and play the spectrum recording back in HDSDR and you will get be able to see and hear how well these radios did or did not perform. The sampling rate for the recordings was set to 48 Hz. 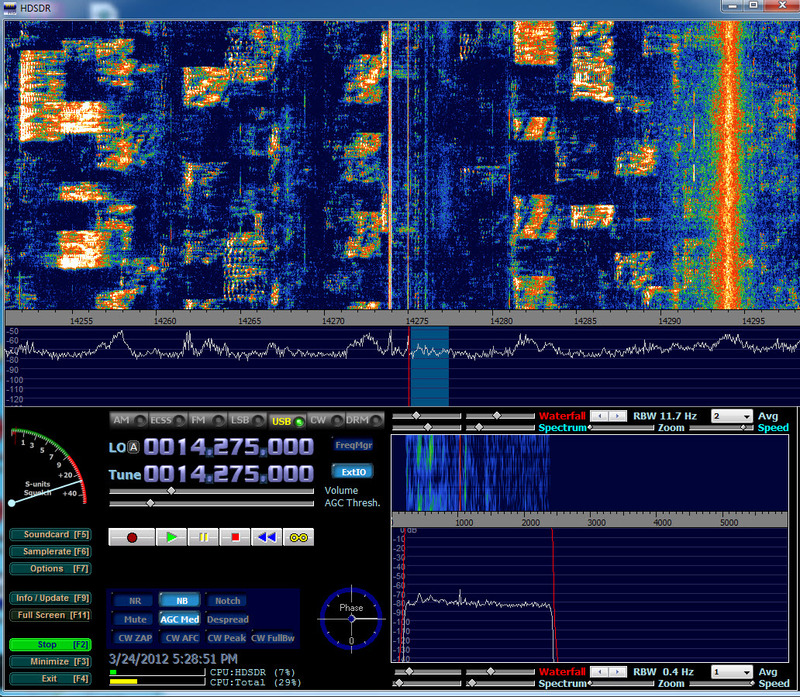 Note* – Both files for both Radios show a band of RFI at my QTH. This is not the fault of either radio. I’m afraid that the second file that should be Softrock WWV 15000KHz has the same name as the corresponding Dj-X11 file. Anyway I’m trying to download both to compare. Hopefully just the name is mispelled. that the noise floor was slightly higher on the DJ-X11 on Medium wave.